X-Men receiver Kaion Julien-Grant was named the StFX Football Offensive Player of the Week for the week of Aug. 31, 2018. Kaion, a 4th year Human Kinetics student from Toronto, scored two touchdowns in the X-Men’s 30-24 overtime win over Acadia Friday night. He caught an 18 yard pass late in the second quarter and a 25 yard pass in double coverage at the start of the 4th quarter. Kaion had 10 receptions for 109 yards in the game and 230 all-purpose yards with his 77 yards on 4 kick-off returns and 44 yards on 8 punt returns. 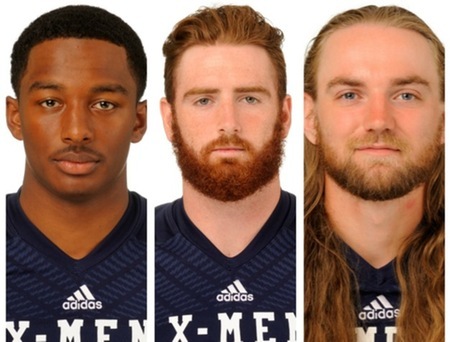 X-Men defensive back Dylan Bell was named the StFX Football Defensive Player of the Week for the week of Aug. 31, 2018. Dylan, a 1st year Education student (5th year eligibility) from Brockville, Ont. came up huge on the X-Men defense in their overtime win over Acadia on Friday night. Dylan led all tacklers in the game with 12, including 10 solo tackles. He also had a break-up and one tackle for a loss of 2 yards. X-Men kicker/punter Kieran Burnham was named the StFX Football Special Teams Player of the Week for the week of Aug. 31, 2018. Kieran, a 4th year Arts student (3rd year eligibility) from Cambridge, Ont. played a big impact in the X-Men’s overtime win over Acadia, racking up 393 yards on 9 punts and 228 yards on 4 kick-offs for a punting average of 43.7 and a kick-off average of 57.0. Five of his punts were inside the 20 and Kieran also kicked three extra TD points in the win.